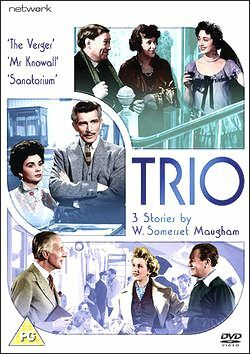 ‘If you like to take the [leading] character as a flattering portrait of the old party before you, you’re perfectly at liberty to do so.’ Thus the great British writer Somerset Maugham himself introduces the third story in this 1950 adaptation of three of his short stories. It’ll give you a good idea of the tone of the piece. Everyone is awfully polite and understated if they’re from the better off, and bluntly direct if they’re not. First up, The Verger, is a tight little story about a man sacked from his job at a church because they discover he can’t read or write - he goes on to prove that’s no stumbling block to advancing in life. The second, Mr Know-All, shows a character on a long voyage harassing everybody he comes into contact with and who knows the price of everything and, this is the twist, the value of everything as well. Which leaves Sanatorium, where a tubercular writer takes respite in the relaxing environs of a Highland sanatorium. These nicely sketched, achingly quaint and morally archaic short films are a small treat, while the mannered performances from Jean Simmons, Bill Travers, Wilfred Hyde White and the marvellous Michael Hordern among others have the effect of making one feel terribly imperial. Tiffin, anyone? Minimal extras.